A small housing development with a distinctly equestrian flavour goes under starter’s orders in picturesque Castle Eaton, on the Wiltshire / Cotswolds border, this week. The five houses have been sympathetically designed and built by a local developer with a fine pedigree: Bower Mapson has a bulging trophy cabinet, with ten What House National Design Awards, a National House Building Council Pride in the Job quality award, and two Daily Express British Housebuilding Awards to their name. And this year Prime Minster David Cameron presented the firm with a commendation in the Best Designed Housing Project Award of 2012 from The Sunday Times for their 106-home scheme in his home constituency town of Witney. While two of the properties at Castle Eaton development The Paddocks have already been snapped up, thoroughbred estate agent Moore Allen & Innocent is offering the remaining three for sale from this weekend. First out of the gate is The Forge, a handsome four bedroom detached house at the front of the development with detached garage, priced at £575,000. Hot on its heels is Carriage House, a four bedroom detached house at £435,000. 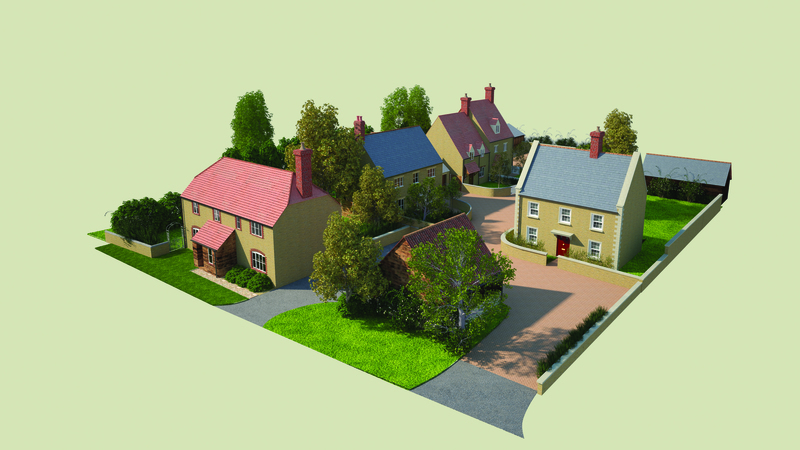 And bringing up the rear is Stirrup Cottage, a three-bedroom semi-detached home over three floors at £320,000. All of the houses are built in natural stone, with a mixture of slate and plain clay tile roofs. Each has a larger than normal double garage: perfect for parking the 4×4. Inside, the homes are fitted to a high standard, with Porcelanosa bathroom products and tiles, and kitchens by locally-based Soul Interiors. And buyers who reserve their homes early can personalise features. Company director Pauline Mapson said: “Depending on the build stage of the home chosen, we can offer a choice of door finishes, kitchen worktops, and floor and wall tiling for kitchens and bathrooms; these are all included in the price of the home. The properties have been individually designed by Peter Mapson, who took his inspiration from the historic core of the village. “Here we find a very rich mix of mostly natural stone buildings from quite modest cottages with low eaves right through to quite large homes, all delightfully mixed together,” he said. The developers have strived to be good neighbours, keeping disruption to a minimum, and have supported the local economy by awarding contracts to local tradesmen and suppliers. Castle Eaton itself maintains all the allure of a Cotswold village, while being a stone’s throw from the commercial centre of Swindon. It boasts the first pub on the Thames, the 18th century Red Lion, a Norman church, and a village hall with Post Office.